Exploring Emperor Charlemagne’s vision on a cruise through Europe aboard Amadeus Silver II – despite the problems caused by low water. Some people collect canals as part of their cruising bucket list. Great man-made waterways such as those in Panama, Suez and Cape Cod are regularly transited by a host of passenger ships. Other less well known short-cuts are increasingly popular on the cruising roster: the Corinth Canal in Greece; the Göta Canal in Sweden and the Kiel Canal in Germany to name but a few. Recently I came across another commercial fast-track that now carries more guests than goods. The Rhine-Main-Danube Canal traces its roots back to 739 AD when Charlemagne the Great dreamed of connecting the two greatest rivers in Europe. Named the ‘Fossa Carolina’ in honour of the first Emperor of the Holy Roman Empire, it is believed that the canal was 9,843 feet long and 328 feet wide and cut through the European Watershed between the Schwäbische Rezat – a tributary of the Main River; and the Almühl – a tributary of the Danube. Inspired by canal constructions in England and France, King Ludwig I of Bavaria wanted to realise Charlemagne’s idea of a continuous waterway across Europe. The ‘Ludwigskanal’ was started in 1836 and inaugurated 10 years later. To overcome the differences in water levels, 101 locks were constructed. Following heavy damage during World War II the canal was officially closed in 1950. In 1921 the German government and the state of Bavaria had formed a company to build a much larger Main-Danube Canal. Completed in 1992, the canal is 106 miles long and runs from Bamberg to Kelheim. To regulate the different levels of the Main and Danube rivers there are 16 locks, each around 625 feet long, 40 feet wide, and up to 100 feet deep. In tandem with this project, the 239-mile navigable portion of the Main River, from the confluence with the Regnitz near Bamberg to the Rhine above Mainz, saw the construction of 34 locks of similar dimensions. This was no mean feat as the course of the Main twists and turns like intestinal loops. During this period ‘the spade is mightier than the sword’ became Germany’s slogan. Charlemagne’s vision had been realised with a 2,178-mile waterway linking the North Sea with the Black Sea. 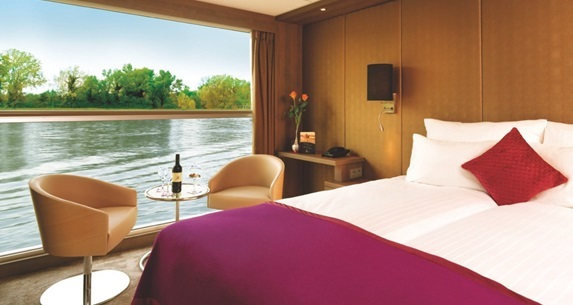 This heralded a new chapter in European river cruising as the Rhine-Main-Danube Canal now permitted passenger vessels to offer leisurely voyages from Amsterdam to Constanta. With autumnal colours at their most vibrant, an October cruise from Nuremberg to Amsterdam seemed like a perfect alternative to an ocean cruise of the Canadian Maritimes and New England during the season of mists and mellow fruitfulness. What I had not bargained for was low water levels on the Danube at Passau. 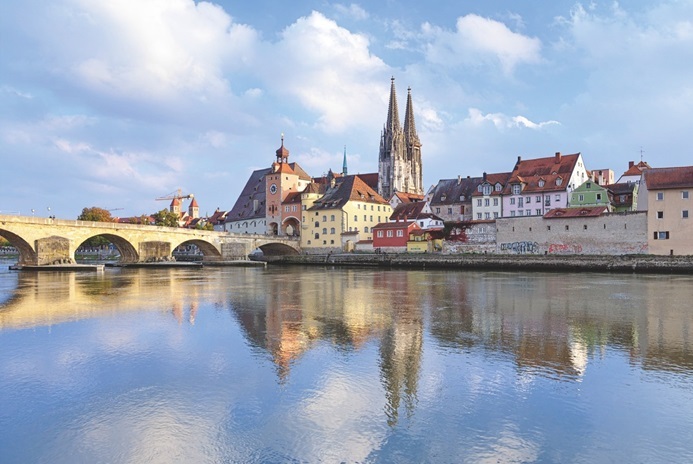 Prior to heading to Germany, Amadeus River Cruises advised us that our cruise would start in Regensburg rather than Nuremberg and when we arrived in this quaint medieval town it was apparent that our vessel was not the only one affected by the Danube’s water levels. The sleepy riverside dock had been transformed into river cruise central, with 12 vessels lined up in a scene reminiscent of the Nile in its heyday. We were warmly welcomed aboard Amadeus Silver II and were immediately impressed with the spaciousness of this sleek vessel that launched in April. Accommodating 168 passengers, suites and staterooms are spread across three decks. The Panorama Lounge and Bar as well as the small Amadeus Club lounge and Hair Salon are on the uppermost Mozart Deck; the restaurant , reception and boutique are on Strauss Deck; while there’s a fitness room with a running machine and exercise bikes as well as a massage room on Haydn Deck. A top the vessel is the Sun Deck with shuffle board, chess board and loungers; due to the low bridges on the Rhine-Main-Danube Canal and Main River this was closed until we reached the Rhine. This also impacted on the ship’s Wi-Fi which was unavailable due to the satellite domes having to be lowered. A notable feature is the extensive use of glass with floor-to-ceiling windows throughout. Decor was a mix of aubergine and taupe with ivory silk accents which reflect the feminine touch brought to the vessel by the wife of the company’s ownerDr Liiftner. 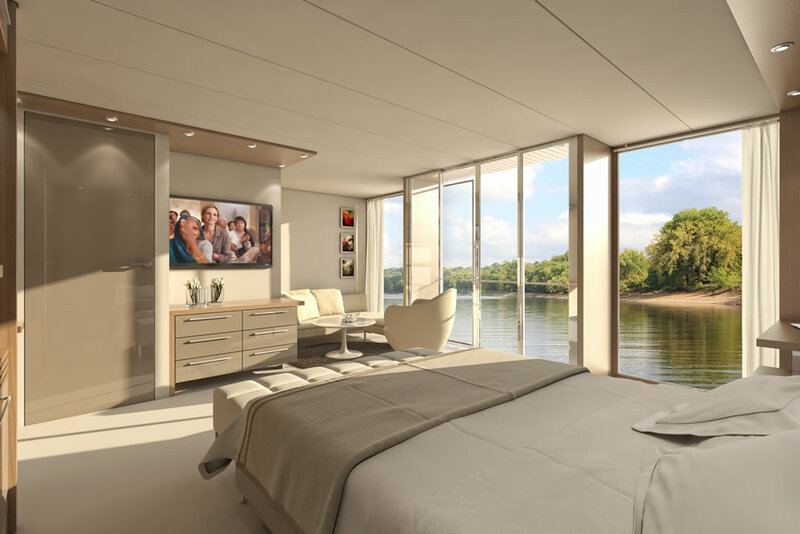 The 12 suites each have a balcony; the rest of the staterooms have drop-down panoramic windows, except for the nine lowest grade staterooms which have narrow windows. The colour scheme is a modern fusion of cream and burnt silver with a bronze silk wall fabric behind the bed which tones nicely with the smoky-grey carpet. There is a generous walk­ in wardrobe, flat-screen television showing BBC World and CNN, a stocked mini-bar. Bathrooms are well-designed, the glass shower is remarkably large by river cruise standards and Ritual unguents are replaced daily. As there were only 104 passengers on our cruise the restaurant was able to accommodate requests for tables for two and service was prompt. 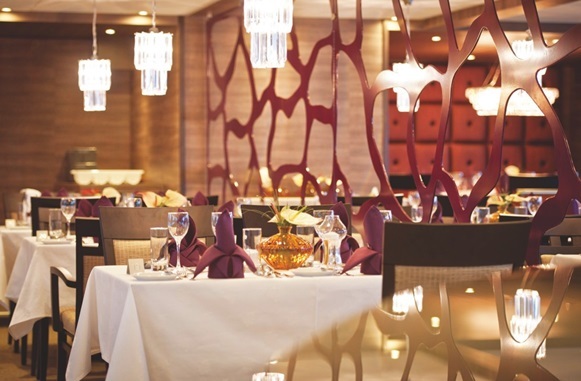 Breakfast was buffet­ style from the central food station; lunch could either be a light affair in the Panorama Lounge or served in the restaurant; dinner was accompanied by a high-quality selection of German and Austrian wines. We enjoyed the cuisine especially at dinner, which always featured two choices of appetiser; two salads; three entrees; and two desserts; there was also a selection of excellent cheeses. Amadeus River Cruises offers three excursion packages that can be booked at a discount in advance; however, keenly-priced individual tours at each destination are available in the ‘Inspirational Discoveries’ selection. We had opted for the latter option which proved prudent due to alterations in the itinerary as a result of the impact of the low water levels necessitating more ships than would be the norm vying to transit the locks of the Rhine-Main-Danube Canal. 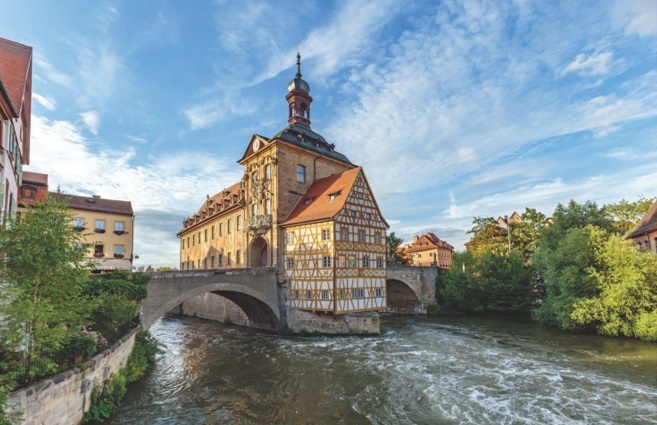 We visited Bamburg where the Old Town Hall, dating from 1386, is situated in the middle of the Regnitz River; medieval Rothenburg ob der Tauber with its 42 gates and towers; and Wurzburg where we saw Tiepolo’s fresco on the vaulted ceiling in the Bishop’s Residenz. High-gabled houses and cobbled squares clustered around the Gothic Town Hall at Miltenberg, but when we reached Wertheim we traded the tour for a crisp tincture of a dry, fruity Franconian wine in a local weinstube before climbing back on board Amadeus Silver II, which had by now caught up with us. The next afternoon the setting sun burnished the golden sycamore leaves as we arrived in Rudesheim, a bucolic riverfront town in the small wine-producing region of Rhinegau. The Rhine doesn’t just complement landscapes, it makes them. The hills either side of the Rhine gorge have evoked myths and legends with their brooding darkness. Little wonder Goethe’s journey down the Rhine in 1774 was the start of the Age of Romanticism. If ever there was a man-made structure to equal the natural grandeur of the Rhine, it is Cologne’s vast Gothic cathedral with twin spires soaring 515 feet. But all too soon industrial backd rops replaced romanticism as we headed towards journey’s end in Amsterdam. A good river is like a good story – there has to be an exciting beginning, an interesting middle bit and a climax at the end. When three rivers are involved the tale becomes all the more excursive. 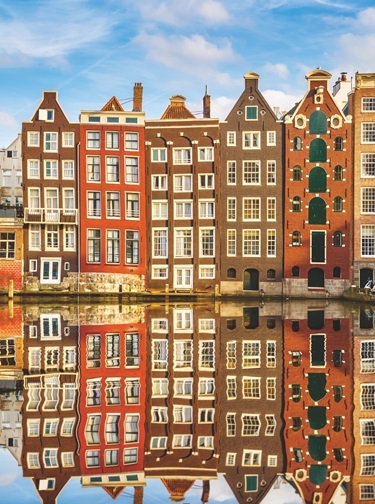 Fairy-tale castles, vineyard-clad slopes, medieval towns and ancient villages; a cavalcade of cliches perhaps, but the addition of 50 locks turned our river cruise into a quixotic page-turner.